It was revealed recently that Playtonic Games, formed by ex-RARE employees, would be making a new game. Today, information on it was finally revealed. 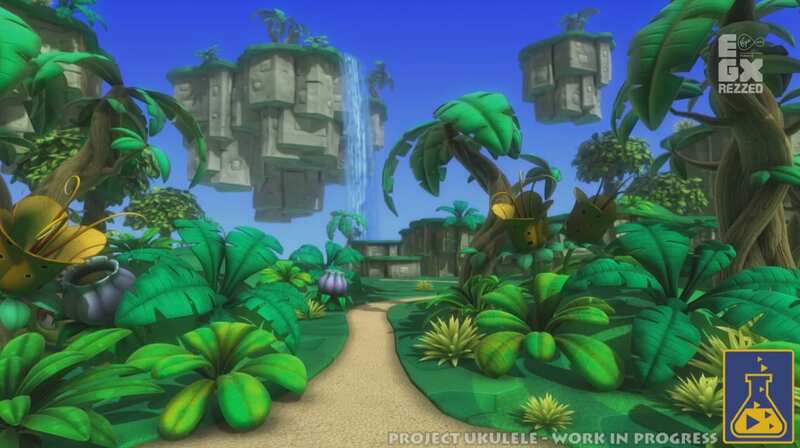 The new game, which currently has no name other than the tentative Project Ukulele, will be a 3D platformer similar to Banjo-Kazooie and Banjo-Tooie, which are cited as inspirations for the game. Not only will the game play like a Banjo game, but it will also sound like one; Grant Kirkhope has been confirmed to be writing music for the game, and has already begun writing a tune for it. Of course, Project Ukulele will have lots of collectibles, but Playtonic has said that they want them to mean something. Other than that, not much is known about the game. No characters have been officially revealed yet, but on their Twitter, Playtonic said, “And for anyone asking why we didn’t introduce our new heroes today – we did. Didn’t you see them?” There is a character obscured in the bottom left of the picture below; is it possible they could be one of the mentioned heroes? Due to the incredibly positive response they have received about the game, Playtonic is planning on launching a Kickstarter in May to increase the scope of the project. They have not announced any platforms for the game yet, but they have said that they want people “to be able to play on [their] favorite platform.” Although nothing is official yet, they showed interest in Wii U and even Amiibo – with the developers having experience working with Nintendo in the past, could Project Ukulele be the first third party game to have Amiibo figures made for it? I've been playing video games for my entire life. I intend to develop them myself one day, but for now, I'm writing about them. My favourite games are Pikmin 2, Earthbound, and basically any other game made by Nintendo. I also like Indie games such as Bastion and Thomas Was Alone, and I hope that my writing will allow independent developers to get the exposure they deserve.